Oracle released VM server 3.0 in August and while you may have missed that announcement, it’s an important and exciting update to a very valuable tool for developers and IT administrators. The drive for virtualization comes from two different directions – from developers and from IT administrators. Developers and users want to be able to stand up a platform quickly, play with (and break) that environment, and use it for development, demos, and testing. IT administrators want to increase scalability, flexibility, and resource utilization, and also have a more centralized approach to management. OVM 3.0 provides substantial improvements to both those constituencies. Keys to both of these are the improvements in the Virtual Assembly Builder (which was first introduced about 18 months ago, but had limited tools available). OVAB allows you to create standardized “software appliances” and templates and then, using OVAB Studio, drag and drop these components into a deployable assembly. The super cool thing is that the configuration steps are templated – so that the database connection to the WLS and the storage for each tier are configured automatically. So, those of us who regularly have to build a virtual environment with a particular version of a database, application server, web tier, directory, etc. can stitch one together in minutes rather than hours and deploy it immediately. To make things even easier, Oracle has provided more than 100 templates of pre-assembled deployments (although there are none yet available for WebCenter Content, Spaces or Sites). The same tools also allow for much quicker and more controlled deployments within an enterprise’s virtualized infrastructure. Need to stand up a performance testing environment that matches production? That’s now a job that takes less than an hour rather than days. In addition, you can be sure it’s identical and not have to trust that the configurations were manually copied correctly. Oracle’s own presentation on OVAB shows deployment of environments take 5 to15 days – in my experience it can often be much longer. Among other highlights that I’ll review in another post are the ability to manage storage much better across the whole deployment (including features such as de-duplication and real-time LUN resizing) and seamless management of the VMs using Enterprise Manager. 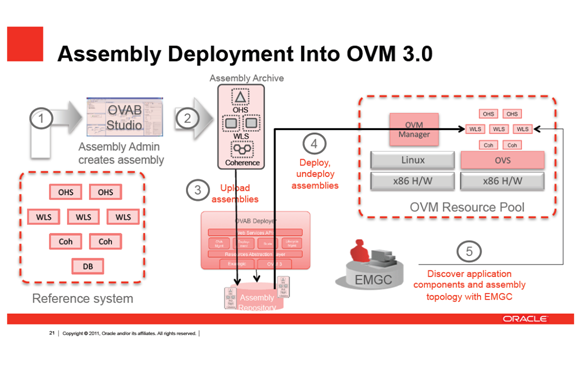 The diagram below gives an overview of how the virtual assembly deployment process works, but the best way to understand it (as is so often the case) is to download and experiment with it. Oracle fully supports all applications running on its own VM server, in contrast to its policy on other virtualization platforms (although in practice, we have yet to see this invoked). OVM is one of a limited range of virtualization platforms that can be used to partition processors from a licensing point of view. We are very excited at TEAM about the new capabilities of OVM 3.0 because it’s allowing us to manage environments and deployments so much more efficiently and because it’s a key part of an exciting new offering to be announced soon. Stay tuned! Going to OpenWorld? Talk to us about virtualization there! Make an appointment here! This entry was posted on Wednesday, September 26th, 2012 at 4:44 pm and is filed under Oracle, WebCenter Content. You can follow any responses to this entry through the RSS 2.0 feed. You can leave a response, or trackback from your own site.